FROM this month, foreign workers in restaurants and retail shops can be asked by their bosses to do more than one job. Previously, they could do only the job they were hired for. So before the rules were changed, a waiter could not wash dishes or man the cash register. This latest job flexibility scheme for work permit holders is a concession by the Ministry of Manpower (MOM) to help firms in the service sector cope with the tighter curbs on foreign workers. It is timely. These firms face a double whammy from this month: Their foreign-worker quota has been cut and they will pay higher foreign-worker levies over the next two years. And since these firms cannot hire more foreigners and have to pay higher taxes for currently employed ones, it makes sense to permit their foreign workers to do more work. The ministry was clearly worried about bosses exploiting workers when it issued a set of guidelines asking firms to be sensible and reasonable when getting their workers to do more. Firms have to put the new job scope for their workers in writing, train the ones who agree to take on the additional roles and pay them more, said the MOM. Besides concerns over exploitation, something else bears close watching too: Will the scheme boost productivity? It will take more than safeguards for the new move to raise labour productivity. And the local workforce provides a clue on what might happen. COMPANIES are already free to get their local workers to do more than one job - as long as they do not break labour laws. But having interviewed many workers and company bosses as a journalist covering the manpower beat, I have met only a small handful of multi-skilled local workers. They are as rare as finding the sambar deer in the MacRitchie nature reserve. So having a scheme that allows workers to multitask is not going to boost labour productivity in itself, unless three corresponding changes also take place. First of all, firms have to reorganise their business operations so that their employees can do multiple jobs. Mr Zainal Sapari, a labour MP who has been pushing firms to boost productivity by reorganising their jobs, said that two things are holding firms back. Besides the cost of buying new equipment and training workers to use it, firms also worry about how their business operation and bottom line would be affected by such job redesigns. "Job redesign is moving faster in some sectors than others," he said, pointing to the hotel sector as one that shows promise. Two years ago, the Park Hotel Group started a three-in-one job scheme in which workers were trained and put to work as waiters, receptionists and housekeepers. They were paid as much as 50 per cent more than the staff who performed one job. Still, one may argue that such a scheme is not too difficult to implement in a hotel in the first place. 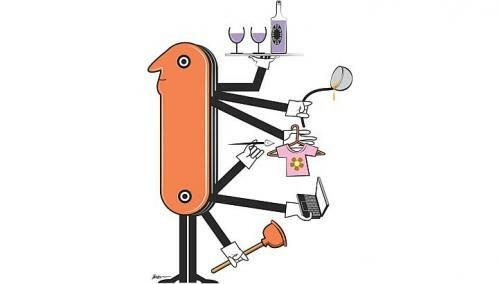 A hotel faces predictable peaks and troughs in its labour needs: Waiters are needed during the dining hours, housekeepers rush to clean rooms in the late morning and receptionists are busiest in the afternoon when guests check in. No substantial job redesign is required and workers are merely put to work as and when they are most needed. One other local hotel went one step further this year. The Holiday Inn Singapore Atrium in Outram Road trained all nine of its security guards to be bellhops, and five of its bellhops to be security guards. These 14 Singaporean employees received a pay hike of between 10 per cent and 18 per cent for doing a wider range of duties. The hotel's general manager, Mr Sam Davies, said that the cross-training was instigated not just by the labour crunch but also to provide locals with better-paying jobs so that they can be retained. Still, these two hotels are the exception rather than the norm. Even for them, workers who are crossed-trained form a minority. Besides the hotels and some restaurants that have trained their staff to wait at tables and man cash registers, there is a dearth of examples in other sectors of how cross-training has increased productivity or addressed the manpower shortage. So even if firms are willing to reorganise their business operations, workers doing multiple jobs are not going to be the mainstay of their workforce. For now, these are likelier to be found in hotels and restaurants. BUT this can change if there is a parallel shift in how firms, especially property owners, outsource. Mr Woon Chiap Chan, the country managing director of ISS Facility Services - one of Singapore's largest cleaning companies with over 6,000 cleaners - has a bold idea. "If more companies award multi-service contracts, there is a chance for the multi-skilled workers scheme to work," he told The Straits Times. This is the second change that will give a boost to the job flexibility scheme. Property owners - condo managements, shopping malls and even government agencies - typically parcel their service contracts into three parts: They look for different companies to maintain, protect and clean their premises. If these contracts are merged, there will be economies of scale and an incentive for the contractor to find workers who can do all three jobs, say, an electrician who also handles cleaning machines or operates security cameras. Such a multi-skilled worker will definitely be paid more than what an electrician, security guard or cleaner earns individually. At the very least, this person can be tasked to supervise cleaners, guards and building maintenance workers, which will still increase labour productivity because three supervisors would have otherwise been needed. But some security firms are not excited by the prospect of having their guards do other jobs. The boss of one such firm remarked that having a guard do cleaning work is a distraction since guards need to be alert at all times. Checks with security and cleaning industry veterans found that such omnibus contracts are rare here. It is up to the local property owners to take the bull by the horns. There are already international companies in Europe and the United States that provide cleaning, maintenance and security services to their clients. There is no reason why such a model will not work here. BESIDES firms and owners of premises, there must also be enough workers who are willing to take on different jobs for higher pay. This is the third factor for the job flexibility scheme to work. Local entrepreneur Wei Chan, who runs several food and beverage businesses, said workers' attitudes matter. For instance, a multi-skilled worker may be asked to pull more shifts. When asked why workers turn away work even for higher pay, he replied diplomatically: "They want a five-day work week, (higher) job designation and work-life balance." Another cleaning company boss said: "Will an electrician even do cleaning work? He may see cleaners as unskilled and the job as beneath him." On the other hand, social worker Jolovan Wham is concerned that bosses may exploit workers. Once the foreign workers have been made to do more jobs, the local workers will be next, which will deter even more locals from joining, say, an already shunned sector, he argued. The balance probably lies in-between: Not all workers can be expected to be equally enthusiastic or hungry for more work, but with fair bosses, reasonable pay and proper work conditions including work hours, most can be motivated to do more work. To be sure, the job flexibility scheme is a sound idea, be it for local or foreign workers. But there are hurdles to overcome if it is to give a significant boost to Singapore's labour productivity. It comes down to whether firms can reorganise their businesses, whether companies that outsource work are willing to hire big contractors to create economies of scale and provide incentives to recruit and train workers who can perform multiple roles, and finding sufficient numbers of workers willing to do multiple jobs. Job flexibility can take off only when all three pieces of this puzzle are in place.